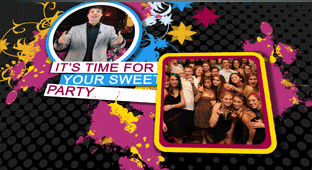 You only get one sweet 16 party – make it an event to remember! Entertainment provided by our professional artists can make this most magical of nights everything a girl could possibly dream of! We have sweet 16 performers, musicians, singers and Bands and DJ’s to get the party started! If you need sweet 16 formal wear to bring a touch of class to your party, we have all the right vendors listed here for you! Scout out your perfect sweet 16 location and then rent out a Party Bus or Limo to make sure that your guests arrive and leave in style! Make the memories last with our expert photographers and videographers to truly make this a night to remember!